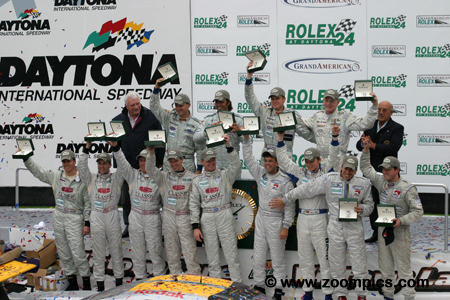 The 42nd Rolex 24 at Daytona took place on the weekend of January 31 and February 1. There was a total of 53-starters (17-Daytona Prototypes, 14-Super Grand Sports and 22-Grand Touring) which was up from previous year. Drivers would compete for 24-hours on the 12-turn, 3.56-mile track which utilized an infield road course and almost the entire tri-oval. Weather impacted this year’s event. Heavy rain created treacherous conditions, resulting in a three-hour caution period. The situation grew worse and the race was red flagged – the first time since 1989 when the race was stopped for four hours as the result of heavy fog. With the rain subsiding late Sunday morning, the race was restarted at 10:30 am. 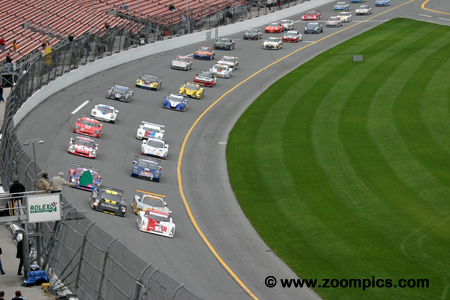 The start of the 42nd running of the Rolex 24 Hours at Daytona. Seventeen Daytona Prototype entries receive the starters green flag and are followed by twenty-two Grand Touring cars and fourteen competitors in the Super Grand Sports category. At the end of 24-hours, a Daytona Prototype entry was first overall; unlike the previous year when a fourth place finish was the best result for a car in Grand Ams premier class. 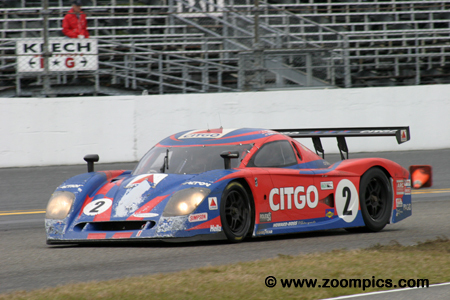 The Bell Motorsports Doran was the first Daytona Prototype to retire at the 2003 Rolex 24 – just sixty-seven laps when the engine failed. That made this year’s victory that much sweeter. The winning drivers from left to right – Forest Barber, Terry Borcheller, Christian Fittipaldi and Andy Pilgrim - pose for a ‘photo op’ on the winning Doran JE4. This was a great start to the new season for the defending DP champions. 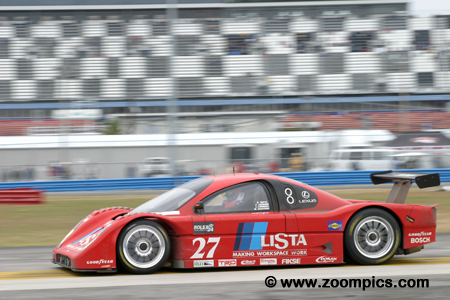 Scott Pruett put the Chip Ganassi Racing Riley MK XI on the pole but was passed before the end of the first lap. The car was in contention until the twelfth hour, when the Riley began leaking fluid. Many pit-stops were made to resolve the issue (replacement of the radiator) and caused the team to drop down the race order. Pruett and his teammates – Max Papis, Jimmy Morales and Scott Dixon finished tenth overall. Starting from the thirty-second grid position, the No. 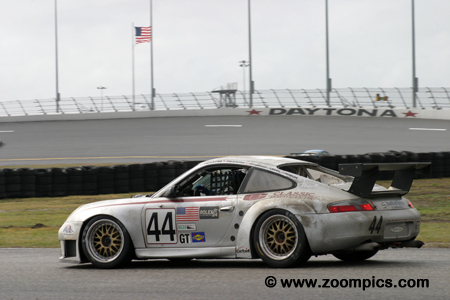 44 Porsche GT3RS entered by Orbit Racing finished second overall and first in the GT category. Sharing the driving responsibilities were Robin Liddell, Johnny Mowlem, Mike Fitzgerald, Jay and Joe Policastro. En route to their victory, the team completed 523 laps – just three short of the overall winner. Winning the first Super Grand Sports class event and finishing ninth overall was the Canadian entry from Doncaster Racing. 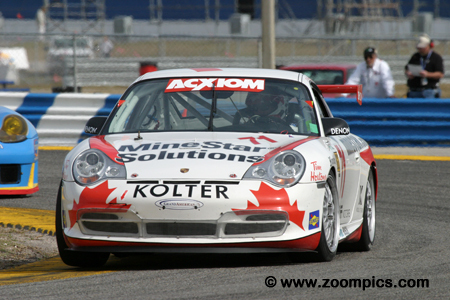 The Porsche GT3 Cup driven by Marc Lieb, Robert Julien, Jean-Francois Dumoulin and Greg Pootmans started from the forty-third grid position. On the way to their victory, they completed 504 laps - three more than their closest rivals. An experienced trio drove the No. 27 Doran JE4 entered by Doran Lista Racing. 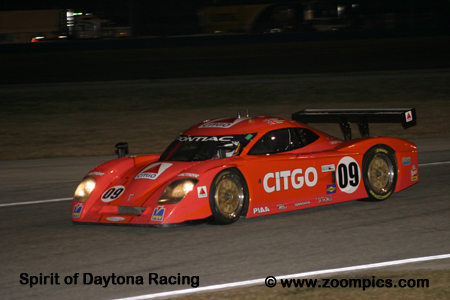 The three drivers – DidierTheys, Fredy Lienhard and Jan Lammers – had a total of five Rolex 24-Hour victories. 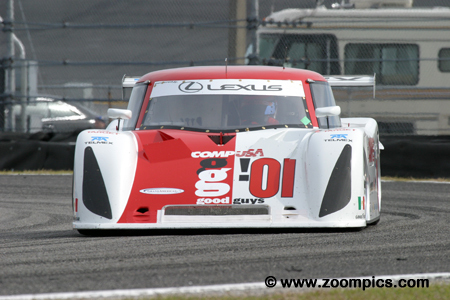 The Lexus-powered car started from the sixth grid position and encountered problems early but finished fourth overall and in the Daytona Prototype class – five laps behind the winner. 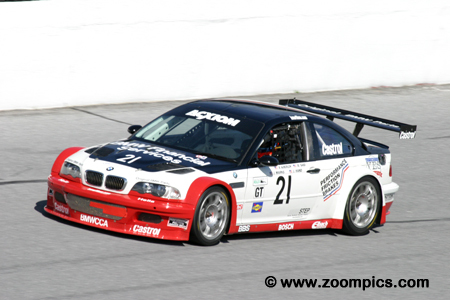 The Prototype Technology Group BMW M3s qualified well with the No. 21 shared by Bill Auberlen, Nic Jonsson and Joey Hand starting third among the GT cars. Unfortunately, it was not to be a good event for the Prototype Technology Group. The No. 21 car retired early in the race with electrical issues and the sister car was out mid-race with overheating problems. Finishing second in the first event for the new Super Grand Sports class were Randy Pobst, Marc Bunting, Andy Lally, John Littlechild and Michael Levitas. 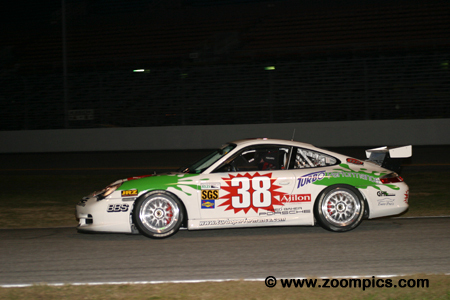 Car owner, Levitas’ TPC Racing team, had a great deal of success campaigning Porsche GT3 Cups in the Grand Sport I class of the Grand Am Cup series. As demonstrated by their results, it was an easy transition for TPC to the Rolex series. It was heartbreak for the No. 2 Crawford DP03 driven by Andy Wallace and NASCAR stars Dale Earnhardt and Tony Stewart. With a three lap lead and less than twenty minutes remaining in the event the right rear suspension on the Crawford collapsed. Stewart was behind the wheel when the car hit the concrete wall on the Daytona ‘Superstretch.’ The team was classified with a fifth place finish. 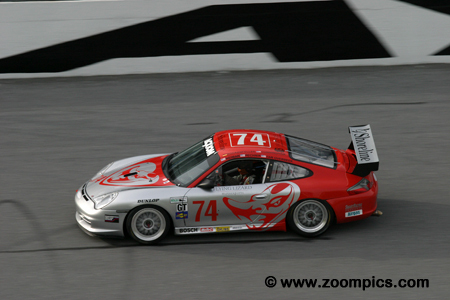 The Flying Lizard Motorsports team entered a Porsche GT3 Cup in the GT class. Sharing the car with Flying Lizard regulars Johannes van Overbeek, Seth Neiman and Lonnie Pechnik were Peter Cunningham and Mike Rockenfeller. Starting from sixteenth on the grid, the team finished third overall and second in the GT category - just 6.9-seconds behind the class winning Porsche from Orbit Racing. The second Doncaster entry was driven by David Lacey, Greg Wilkins, Kenny Wilden, Mark Wilkins and Tom Nastasi. The team qualified forty-ninth overall and sixth in the Super Grand Sports class. During the race the No. 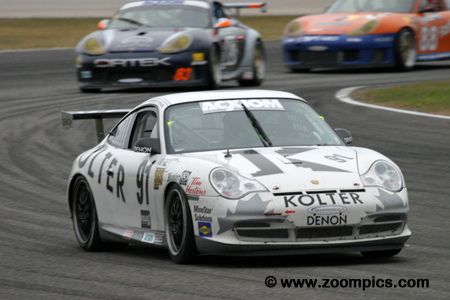 71 Porsche GT3 Cup was always in contention - running much of the event behind their teammates and the TPC Porsche. At the checkered flag, they were thirteenth overall and captured the final spot on the class podium. Like many other teams, the No. 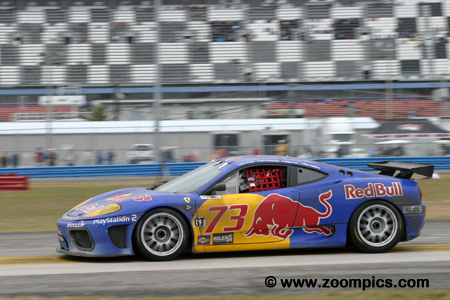 73 BE Racing Ferrari 360 Modena encountered setbacks during the race. However, many of theirs were not as serious as some of the quicker GT category cars. Through attrition, they moved from their thirty-sixth starting position to sixth at the end of twenty-four hours and took the last spot on the GT podium. The Ferrari was driven by Philipp Peter, Dieter Quester, Klaus Engelhorn and Andrea Montermini. 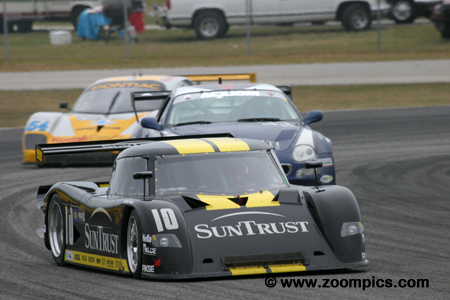 The Sun Trust Racing Riley MK XI led the event numerous times during the first twelve hours. Unfortunately, heavy rain caused electrical problems that required a number of pit-stops. Despite several issues, which included running out of fuel, lead driver Max Angelelli kept the car in contention. But Angelelli’s efforts came to an end when the driveshaft failed. He and his co-drivers – Wayne Taylor and Emmanuel Collard finished eighth overall. The class winners. 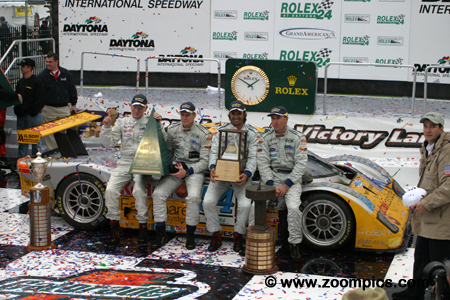 On the top row are the overall and Daytona Prototype class victors from Bell Motorsports –Andy Pilgrim, Christian Fittipaldi, Terry Borcheller and Forest Barber. The GT class winning Orbit team are on the lower left of the podium – Johnny Mowlem, Jay and Joe Policastro, Mike Fitzgerald and Robin Liddell. Rounding out the podium are the SGS winners – Robert Julien, Marc Lieb, Greg Pootmans and J-F Dumoulin.